As World War II rages in Europe and the Pacific, a group of St. Louis women have to keep the home fires burning. Those fires don't just burn wood, though; the ladies all miss going to the theater. With the men at war and the theaters closed for the duration, an idea is hatched. It's time for a new production of Henry V, with an all-female cast storming Agincourt. George Brant's comedy Into the Breeches! makes its St. Louis debut as part of Shakespeare Festival St. Louis' In the Works program. The family-friendly play A Most Outrageous Fit of Madness (inspired by The Comedy of Errors) and two staged readings of Michael Saenz's The Thousand Natural Shocks round out the program. Into the Breeches! 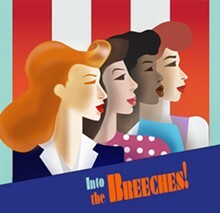 runs Wednesday through Sunday (October 28 to November 18) at the Grandel Theatre (3610 Grandel Square; www.sfstl.com). Tickets are $25 to $55.